Government and the ruling Zanu PF have dismissed circulating reports alleging that some homeless victims of Cyclone Idai in Bikita were being ripped off through paying a daily levy for accommodation, by fellow villagers in the disaster prone district. There were reports that some unscrupulous people in the district were ripping off victims in Bikita by charging them a levy of $10 per night per person for accommodation. Deputy Chief Secretary in the Office of the President and Cabinet (Presidential Communications) Mr George Charamba was quoted saying some of the victims were being ripped off. "We heard it on the news and we effected investigations which even included members of the Joint Operations Command here and we found nothing of that sort here. "Investigations that we have carried so far, have shown that no victim is paying for accommodation here and we even sent our officials to places where that practice was said to be happening and it turned out to be false," said Mr Hadzirabwi. Mr Hadzirabwi's revelation was also corroborated by Zanu PF national political commissar Retired Lieutenant-General Engelbert Rugeje who was speaking in Bikita on the sidelines of a donation of blankets and other materials he sourced from sons and daughters from the district. Rt Lt-Gen Rugeje, who hails from the district, blamed the social media for spreading false reports saying the people of Bikita practiced ubuntu/unhu. "I was disturbed when I heard reports that some victims here were being ripped off because I come from Bikita and I know the people from my home area very well," he said. 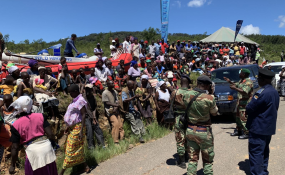 "The people of Bikita, who are predominantly of the Duma clan have a heart, they are known for their purity and uprightness particularly on issues to do with helping each other and under no circumstances would they make life hard for each other," he said.